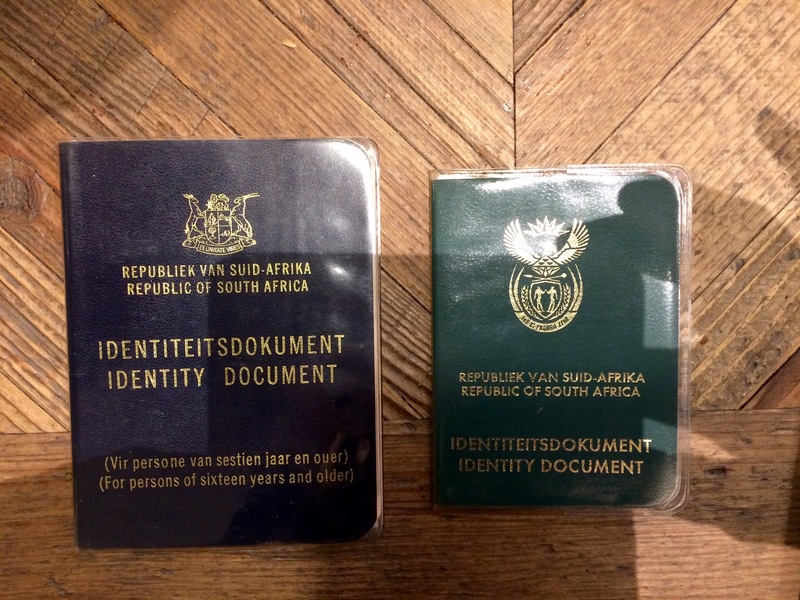 The US has social security numbers and the UK has national insurance numbers, but in Sweden and South Africa EVERYTHING runs on national identity numbers. You cannot do anything without one. In Sweden you need a civic registration number to do anything (visit a doctor, do your banking, rent an apartment, study, work – ANYTHING!). Without one you are completely outside the system. You are unable to visit a doctor, open a bank account, apply for a job and so on. You are assigned this number when you are born or when you receive permission to study, work or live in Sweden. Swedes are really proud of this system as it allows every single system to function well. You have to carry identification with you at all times in order to have access to any system. You show your identification and voila! any system can see you. 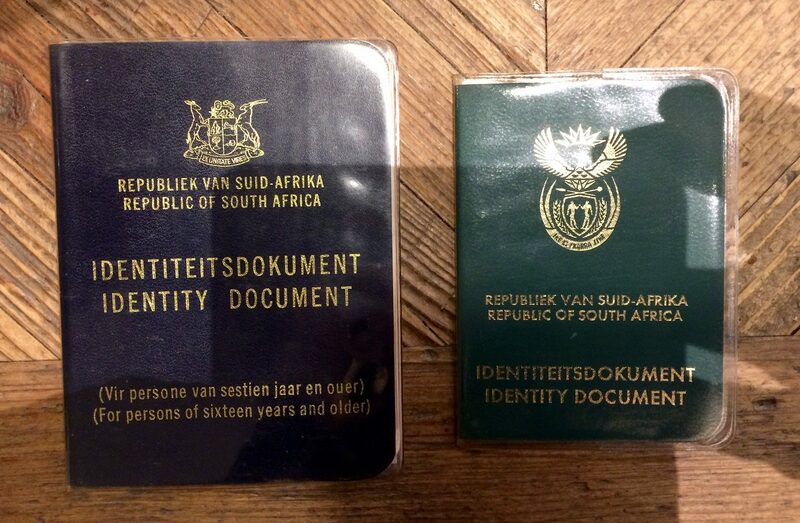 All South Africans had to carry identity books with them, which were checked when you entered a shop/hotel/hospital/bus etc. If you were Japanese you were white but if you were Chinese you were not. When issuing identity numbers, if someone was unable to determine your race, the pencil test would be employed. A pencil would be pushed into your hair. If it fell out you were white, if it stayed in you were not. If you had a relationship with someone from another race, your entire family would be reclassified to the darker colour. 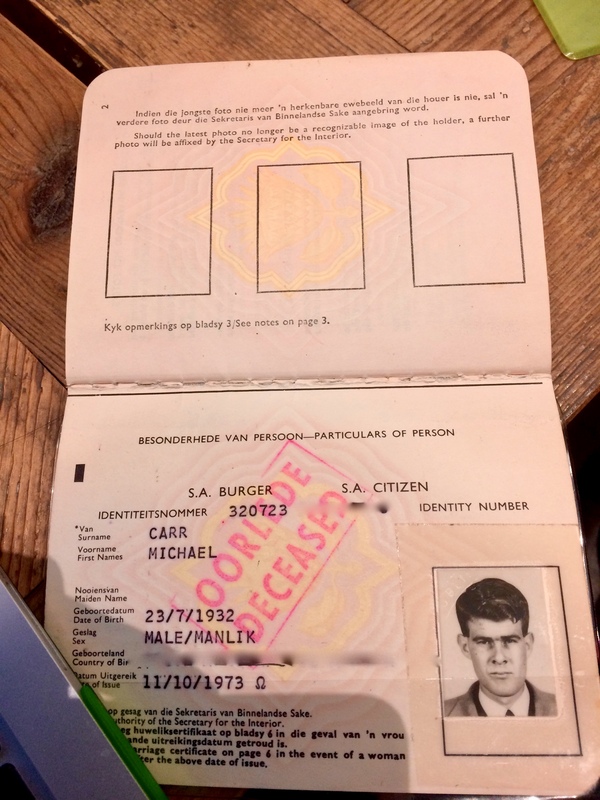 From the early 1980s Black South African people were not actually citizens of South Africa. They were stripped of their South African citizenship and made to live in reserves (aka ‘homelands’) until the law was repealed. What makes it all so shocking is that white people make up only 8% of the South African population, yet they imposed this horrendous system on 92% of of the population. 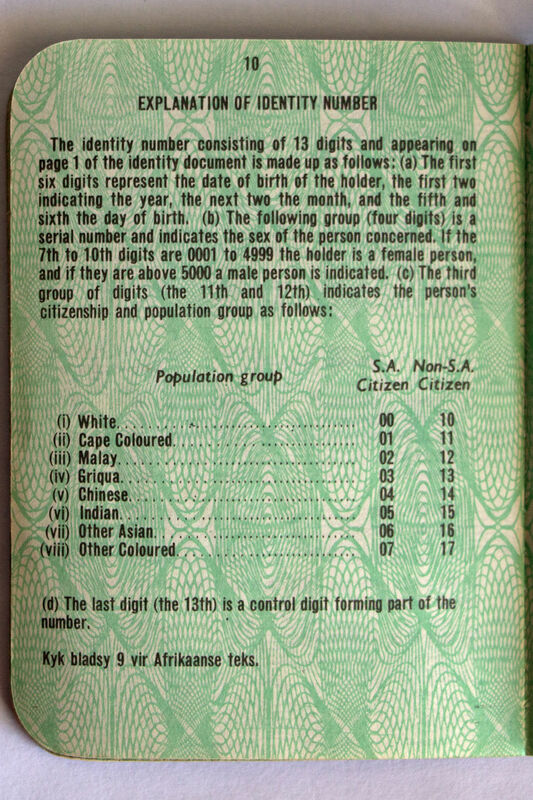 Under the 1950 Population Registration Act, each inhabitant of South Africa was classified into one of several different race groups, of which White was one. Many criteria, both physical (e.g. examination of head and body hair) and social (e.g. eating and drinking habits, familiarity with Afrikaans or a European language) were used when the board decided to classify someone as white or coloured. This was extended to all those considered the children of two White persons, regardless of appearance. The Act was repealed on 17 June 1991. My father used to work in a paper factory and part of his job was analysing clay samples which he collected from quarries and surrounding land. He had olive skin and would go really dark in the sun, particularly as he worked outside so much. In order to prove his race he had to pull down his trousers and show his bottom (the only place that would not have been tan). This must have been so hard for a man like my father who was very very conservative. I never saw him without clothes on but he often had to pull his pants down in front of me in order to enter the white entrance in a shop, or sit down at a café. How hard that must have been for him. 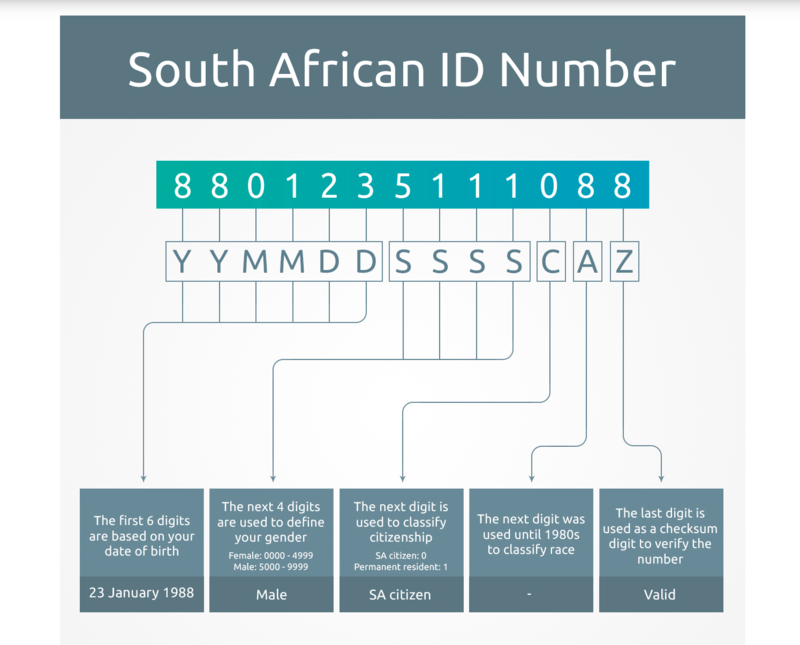 There is no longer any racial element to the identity number. The last numbers still exist, but are now without meaning. 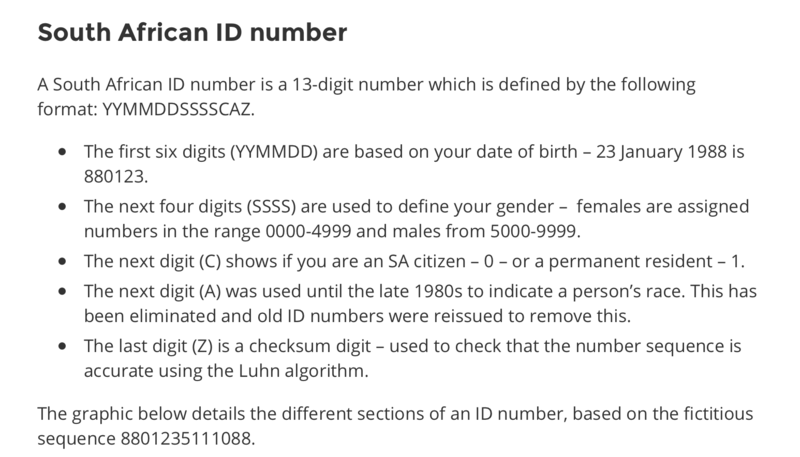 I was issued three new last numbers when apartheid was abolished. 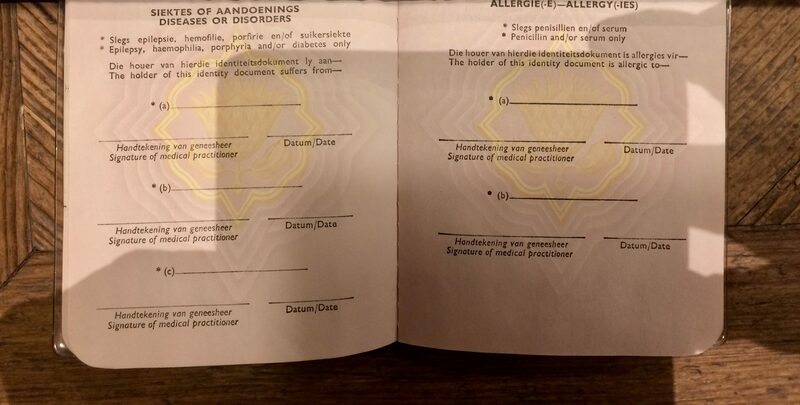 If you wished to be in another area from that in which you were allowed to be, you had to apply for permission, as shown below. There was a referendum in South Africa in 1992 where white people voted to abolish apartheid. Luckily almost 70% voted yes. This is why I get so angry when people say ‘it’s like apartheid’. Very few people today know what apartheid actually was and how deeply it was constitutionalised. Institutionalised racism was used to systematically keep races apart and it stripped black people of citizenship of their own country. Like the Holocaust, we must never EVER forget it so it will never happen again. 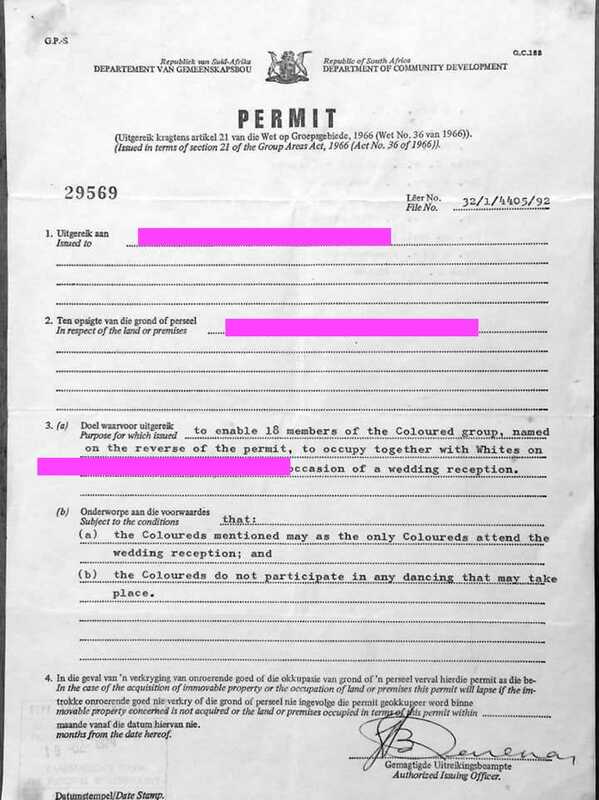 To see it in writing like that is still quite a shock that they would take it to such a detail about the activities permitted. When did you leave S.A.? A huge system was built keeping the races apart. It is quite scary how it permeated everything. The cold facts of the number and its meaning in South Africa tells such a tale – just the facts and so hard. Thank you for sharing this, Janet. The more we all know, the more it may not happen again. Lest we forget.